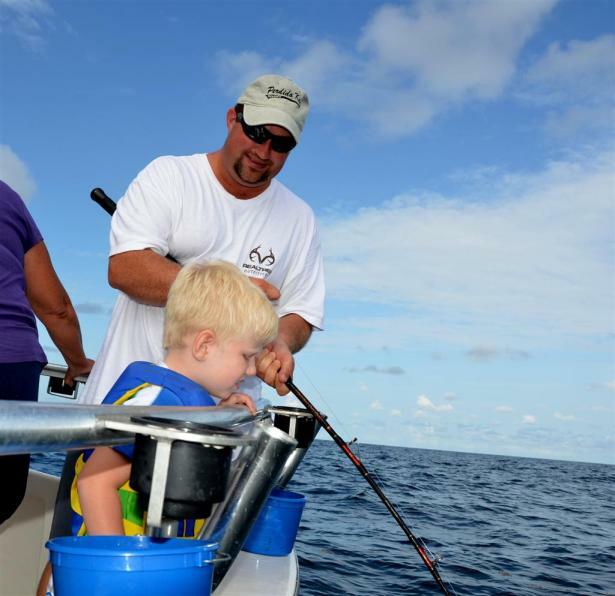 Our boat has a safety rail around the fishing area that makes parents feel comfortable about taking their kids fishing. Why Even Talk About Charter Boat Safety? Before each fishing trip we ask that you arrive at least 20 minutes early. This is because it takes about 5 minutes for everyone to load up and the next 15 minutes going over our safety speech. No matter how many times you have fished with me, you will always get the speech – no negotiation. As a matter of safety, we want you to know that your captain and crew are always alcohol and drug free. We are also certified in CPR and have had AED training every two years. When deciding to write these paragraphs, I thought long and hard about how you would react, when you read a page named “charter boat safety.” I certainly do not want to make you think charter fishing is unsafe, because it isn’t as long as we are careful and don’t make any mistakes that cause an accident. 99.9% of the time, charter boats in Orange Beach operate safely and without interruption. It’s that one tenth of one percent, we call the unexpected that we prepare for. Having all the safety equipment on board is expensive for a charter boat business, but we strongly believe in doing everything we can to ensure safety of life at sea is a priority. Did you know that 90% of the other 6 passenger charter boats operating out of Orange Beach or most any other port only have bare minimum safety equipment on board. That simply means, they only the minimum on board like life jackets, flares and a first aid kit. Coming from a safety background in the transportation industry, that is ridiculous and in my opinion, negligent. We are not like other six passenger charter boats in Orange Beach. We have all the minimum, but we have so much more on board our boat to ensure you don’t have an accident or an injury. 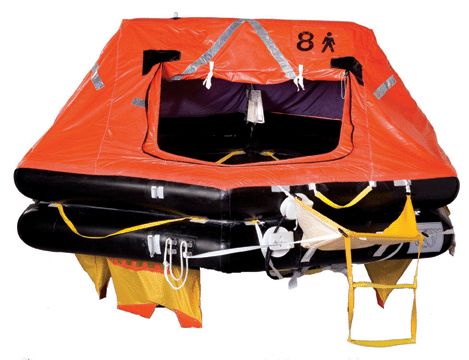 We invested in a $4,000 life raft that costs $960 per year to keep certified by the USCG. 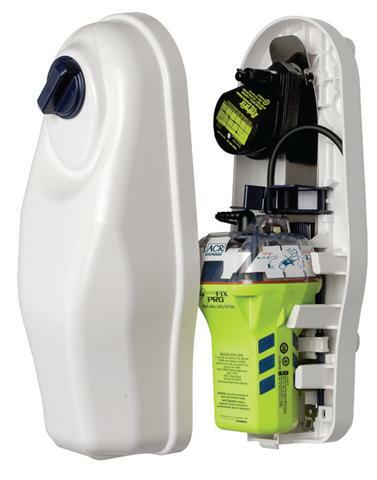 We also have a high water alarm, built in engine room fire extinguishers, a satellite epirb automatic tracking device in case of emergency. We tell you these things, because we want you to feel safe, knowing that we have taken every precaution we could to make sure your charter fishing trip goes off without a hitch or uh oh! 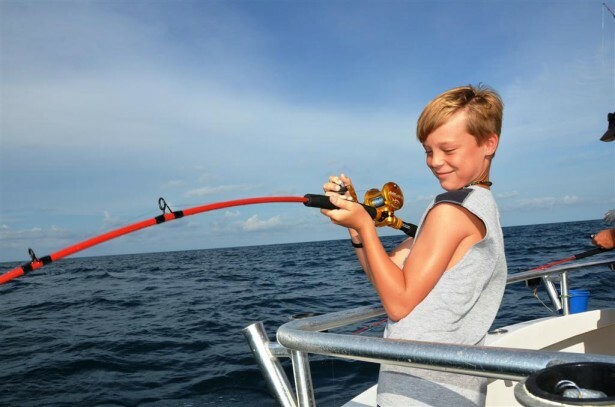 There are some things you need to know about charter fishing that I have written on this page, that can help you make the safest decision for your family’s upcoming Alabama coastal vacation. Our life raft has just been serviced and is ready to go! Only a few 6 passenger charter boats our size even have life rafts. First, I believe “safety at sea is no accident.” That is why we developed proven safety techniques and procedures on our charter boat that can’t be found elsewhere in the fishing industry. I guarantee it. You will be amazed when you realize that safety is all about awareness of situations that can potentially get you hurt or injured. When you leave us, you will most likely apply them to your everyday life, so you to can be safe. A safe charter boat where kids can be kids and the parents can relax! I understand how important it is as a parent, to protect your family and kids while allowing them to experience things in a way that helps them learn and grow. We don’t assume or expect you to know anything about charter fishing safety. After you meet us and we complete our pre-trip safety meeting, you will be part of a process that is more than just an ordinary fishing charter. A lesson I learned years ago about safety: When I first started running offshore boats some 35 plus years ago, my father told me, “If you ever scare anyone, they will never want to go on the water again.” I remember those words and took them to heart. That is why I don’t take chances with our guests or put you in situations that may make you uncomfortable or anxious. Not fishing in unsafe sea conditions: We don’t fish in rough or unsafe sea conditions (seas above 3′ high and 3 seconds apart or 4′ high and 4 seconds apart. This means the height of the wave and the distance the waves are apart from each other. We do find ourselves fishing in 3′ seas and 4 seconds apart. If they are 5 or 6 seconds apart or more, that’s even better. We do sometimes depart, knowing the winds and seas will calm shortly and seas will be more safe. We just do our best not to depart when the seas are really rough. Those waves are no fun for us either. The whole purpose of going fishing is to have a good experience and catch some fish, right? If we took you out into rough seas, we have already marginalized your trip because you will likely not have a good time. I know people react to things differently. What is rough for one person may be perfectly fine with a seasoned angler. What we do is try and find a balance based on you and your family. I am very much in tune with a mother or father being nervous about taking their kids fishing. I understand this and most of all, I care. We take the time before every trip to educate everyone on how we do things on our boat. Even if you don’t fully understand what we are talking about in our pre-departure safety meeting, we understand this and will take the time and demonstrate our procedures to you as many times as it takes until you are comfortable with the simple procedures. Our boat is like a learning classroom. If you do something correct, we applaud you and thank you for being safe. If you do something incorrect, we gently and calmly remind you of our procedure. We do all of this in a fun way. Over the years, we have learned and improved the best way to communicate with our guests. That is why we have developed procedures, not rules. That’s because as a child, we all learned that rules can be broken. As mentioned in the above paragraph, we explain to you and your kids how we do things on our boat. These things include: How to walk around without falling, how to hold on with three parts of your body touching something at all times, how to avoid slips, trips and falls, how to hold your pole, how to flush the toilet, how to bait your hook and the list continues, but you get the picture. We communicate in a way that doesn’t intimidate you or make it sound like we are being rude, sarcastic or disrespectful to you. After you meet us, you will understand why we do things differently on our boat. 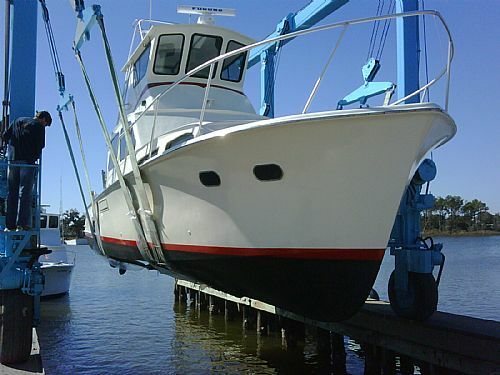 Our boat is pulled out of the water each year to perform routine hull and propeller inspections. We maintain our vessel to the highest of standards. She is sound in her performance and her equipment is always ready to do what we ask of her. When you see our boat for the first time, you will notice that everything has its place and all of our equipment and gear is properly stowed away. We perform scheduled routine maintenance, hull inspections, propellers balancing, shaft wear, zincs, engines, transmissions, cooling systems, batteries, electronics and all of our vessels safety equipment, so we remain ready to go deep sea fishing at a moments notice. We keep our fuel tanks full at all times so you don’t have to worry about running out or having to spend your time waiting on us to top her off. We do have to get fuel frequently because our tanks only hold 240 gallons. So forgive us if you have to wait a few minutes in between trips so we can top our tanks off. There is nothing we don’t do when it comes to being ready to have a safe fishing trip. We even go one step further than most. If we see something worn, rusted, loose or has the potential to cause a problem, we fix it or replace it. As with any mechanical or electrical part, they do wear out over time and sometimes offer no advance warning. But don’t let that alarm you. We know our boat and know when things don’t sound or feel right and that is when we don’t hesitate to inspect the issue. Sure, it cost a lot of money to maintain a charter boat, but that is what separates our boat from the rest of the herd, and it shows. 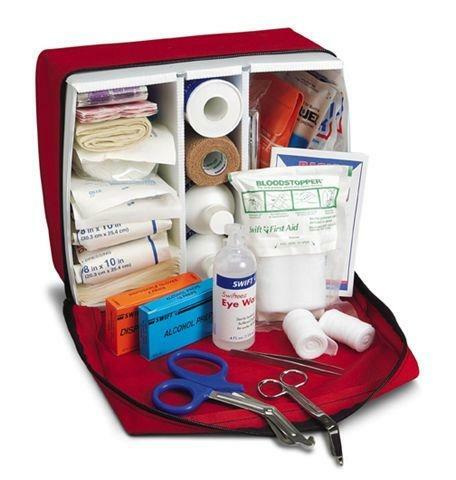 Our charter boat has a first aid kit available. Our boat has a first aid station on board and ready to use. Your crew is certified in CPR and First Aid. 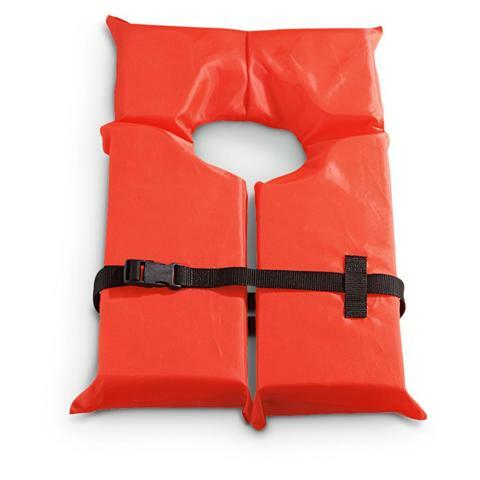 We have a safety life vests of every size available for everyone on our charter boat. If you have an infant, you may want to bring one that fits them better than ours. We have more than enough life jackets on board for everyone, regardless of their age, height or weight. They are located inside the sitting area and underneath the bench seats. We have adult and children life jackets there. A life raft means you don’t have to get wet in an actual emergency. This raft has food, water, shelter, first aid kit, flares and other safety equipment. Wouldn’t you rather have one of these handy in a real emergency? 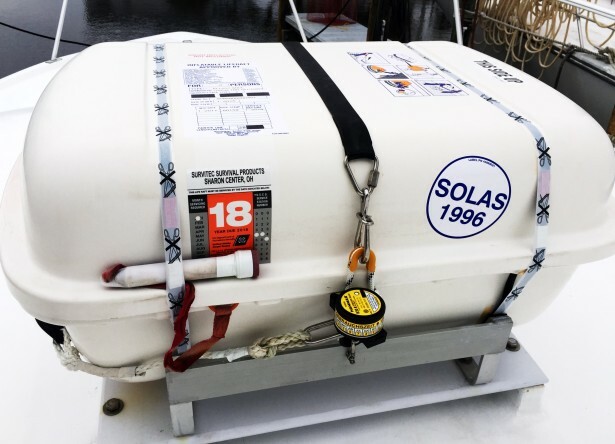 Our charter boat has an inflatable commercial life raft on board that meets and exceeds all USCG Safety Of Life At Sea (SOLAS) requirements. The life raft we have on board, is top of the line and deploys automatically when thrown into the water or can be manually deployed. In the event of an actual emergency, our life raft will keep you dry and out of the water until help arrives shortly thereafter. If an accident were to ever happen and we had to deploy a life raft, wouldn’t you rather step off one boat into another boat without ever getting wet? We one of the only charter boats in Orange Beach that has one of these and families love just knowing its there. EPIRB’s send an immediate distress call to the USCG and emits a GPS signal so they can find us. Having an EPIRB on board our charter boat goes hand in hand with having a life raft, because when it goes into the water, it automatically begins transmitting an emergency locator safety beacon via satellite to the nearest U.S. Coast Guard rescue center so help can be immediately sent to our exact location and quickly pick us up. We have plenty of fire extinguishers on board our charter boat. We have them serviced annually. Having a well maintained fire extinguisher permanently mounted in our engine room is a good thing for every charter boat to have as a safety item. 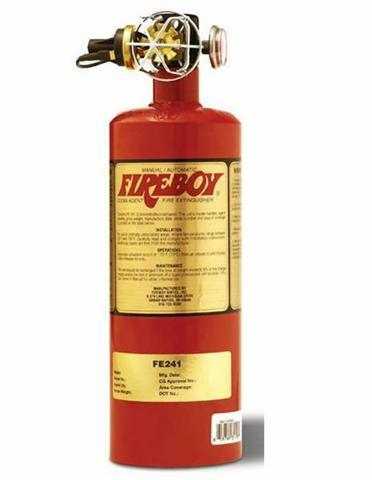 In the case of a fire at sea, our over sized fire extinguisher will automatically discharge and extinguish the flames. We also have additional fire extinguishers in the sitting area and upstairs in the wheel house that everyone has access to. Like all of the other safety equipment on board, we had rather have it and hope we never have to use it, than to need it and not have it. Having live color radar on board gives the captain the ability see approaching rain. We do our best to avoid rain showers, but this is the gulf and there is a chance of rain almost every day during the summer. Part of living along the gulf coast comes with an occasional summer rain shower. We do our best to navigate around these showers, but for safety reasons, occasionally we have to go through them in order to get to clear skies on the other side. Having color radar allows us to see rain showers in real time, and helps us choose which direction we need to head in order to avoid them. 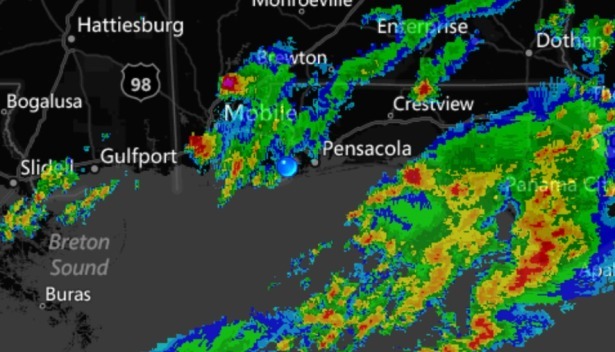 Our charter boat is equipped with a high definition color weather radar on board so we can see inclement weather way before it gets to our area or causes a safety hazard. Having this tool available while at sea is valuable to us. If you would like additional information about our weather related fishing policies, you can read about them about half way down our charter pricing page. 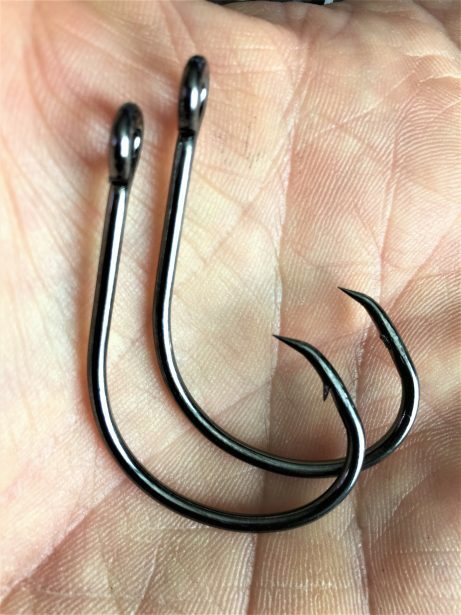 Most people don’t even think about the loose fish hooks that are swinging around and how many people get poked each year with hooks. The hook on the right, has no barb. These are the types of hooks we use. They are safer than the barbed ones. Because of the potential of getting hooked and having to return to the dock due to an embedded hook in someone’s hand or finger, we started using barbless circle hooks. Now, if someone gets accidentally poked, all you do is remove the hook and keep on fishing.